Upon being selected by the Phillies 39th overall in the 2011 amateur draft, outfielder Larry Greene Jr. was often praised for his outstanding power potential. However, after a sluggish start to his pro career, there’s some doubt surrounding the young slugger. 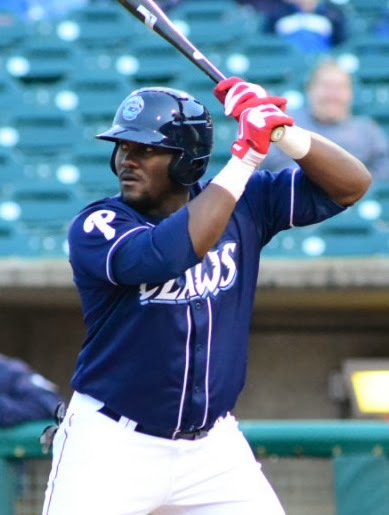 In his first full season of pro ball in 2012, Greene played with short-season Class A Williamsport where he posted a promising .270 average with 22 doubles and 26 RBI in 70 contests. Williamsport’s home park, Bowman Field, is notoriously difficult on hitters, so the lack of power numbers was not concerning even for a guy who had developed a reputation for being a big time power hitter. Moving forward, Greene’s 2013 season was rough to say the least. Billed at six feet tall and weighing 235 pounds, the youngster reported to spring training out of shape and was held back at extended spring training when the regular season began. Greene had become a new father and indicated in one interview with me that perhaps enjoying fatherhood during the winter months had gotten a bit in the way of staying fit. The Phillies brass still very much believes in Greene, who they feel will develop the power that the 20-year-old still regularly displayed in batting practice, even at pitcher-friendly venues like Lakewood’s FirstEnergy Park. His quick bat and uppercut swing project very positively from the left side. This off-season, Greene participated in the Fall Instructional League and attended the Phillies’ Dominican baseball academy in November. Getting extra time on the field with additional instructors and coaches overseeing his every move will certainly be beneficial to a prospect with the kind of expectations that earned him a $1 million signing bonus.